Domaine des Peres de L’Eglise has a long history in the Southern Rhone Valley as the family has been involved in grape growing and wine making in the region dating back to 1884. However, the modern era for the property is quite recent with the start of high quality wines only beginning to take place with the 2007 vintage. Stepping back just a bit, prior to the birth of Domaine des Peres de L’Eglise in 1978, the estate was known as Domaine de Saints Peres. Today, the property is owned by the Cardassi family. Domaine des Peres de L’Eglise owns 15 hectares in the Chateauneuf du Pape appellation. 13.5 hectares are planted for the production of red wine grapes. 1.5 hectares are reserved for the white wine, grape varieties. The terroir for the red wine is clay and limestone soils. The vines are scattered over the Chateauneuf du Pape appellation with their best vines being planted in Les Bosquets, Cabrieres, Grand Pierre, Les Grands Serres, Terre Blanche, Vaudieu and Coste Froid. The best vintages of Domaine des Peres de L’Eglise are: 2018, 2017, 2016, 2015, 2012, 2010, 2009 and 2007. Domaine des Peres de L’Eglise produces 3 Chateauneuf du Pape wines. 2 red Chateauneuf du Pape wines and 1 Chateauneuf du Pape Blanc. Domaine des Peres de L’Eglise Chateauneuf du Pape is produced from a blend of 85% Grenache, 10% Syrah and 5% Mourvedre. The terroir is rocks, sand, limestone and clay soil. The grapes are spread out in various vineyards as they use vines planted in the Cabrieres, Coste Froide, les Grandes Serres and les Terres Blanches lieux-dits. The grapes are partially destemmed. The wine is aged in foudres, used, French oak barrels and tank. Domaine des Peres de L’Eglise Le Calice de Saint Pierre Heritage is made from about 98% old vine Grenache from vines that are more than 100 years of age planted back in 1885. The remaining 2% comes from a field blend of various, AOC allowable grapes. Although, there are vintages produced from 100% Grenache. The vines are planted in the Coste Froid lieu-dit, which is owned entirely by the Cradassi family of Peres de L’Eglise and the Terres Blanches lieu-dit. The the terroir is clay and galets. To produce the wine, 75% of the grapes are destemmed. The wine is aged in demi-muids for an average of 12 months before bottling. The production is only 200 cases per vintage. Domaine des Peres de L’Eglise Le Calice de Saint Pierre is made from 95% old vine Grenache old, 3% Mourvedre and 2% Syrah. 75% of the fruit is destemmed. 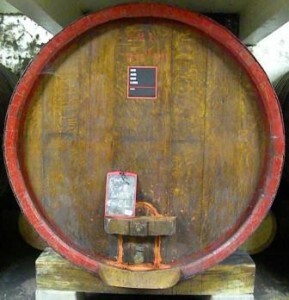 The wine is aged in used, French oak tanks and foudres. The production is on average, 1,250 cases per vintage. Domaine des Peres de L’Eglise Le Calice de Saint Pierre Blanc is made from 25% Grenache Blanc, 25% Clairette, 25% Roussanne and 25% Bourboulenc. The wine is aged for six months in 60% stainless steel tanks and 40% French oak barrels. Domaine des Peres de L’Eglise can be enjoyed on the young side. Young vintages can be popped and poured, or decanted for about 1 hour, give or take. This allows the wine to soften and open its perfume. Older vintages might need very little decanting, just enough to remove the sediment. Domaine des Peres de L’Eglise is usually better with 2-4 years of bottle age. Of course that can vary slightly, depending on the vintage. In the best vintages the wine should be consumed within 3-12 years after the vintage. Domaine des Peres de L’Eglise is best served at 15.5 degrees Celsius, 60 degrees Fahrenheit. The cool, almost cellar temperature gives the wine more freshness and lift. Domaine des Peres de L’Eglise is best served with all types of classic meat dishes, veal, pork, beef, lamb, duck, game, roast chicken, roasted, braised, stewed dishes, sausage, grilled meats, barbecue and cassoulet. Domaine des Peres de L’Eglise is also good with Asian dishes, hearty fish courses like tuna, mushrooms, cheese, pasta, eggplant and tomatoes. The white wine of Domaine des Peres de L’Eglise is best served with a myriad of different seafood dishes, shellfish, crab, lobster, sushi, sashimi, chicken, pork and veal, as well as Asian cuisine. Domaine des Peres de L’Eglise also produces wine from 4 hectares of vines they own in the Cotes du Rhone appellation. Spice box, smoked meat, earth garrigue and dark, juicy plums kick things off. Lushly textured, with soft, ripe tannins and a peppery, herb and fresh, red pit fruits galore, the wine is fruity, polished and vibrant. The blend is made from 85% old vine Grenache, 15% Mourvedre and 5% Cinsault. A hint of smoke enters the perfume along with jammy, black red fruits, pepper and herbs. Ripe, round, fruity and juicy, with good concentration and a long finish makes the wine taste and feel great. The blend is made from 85% Grenache, 10% Syrah and 5% Mourvedre. Deep, dark red fruits, wood, licorice and earthy aromatics leads to a full bodied, round, forward, lusty style of wine with loads of ripe, juicy, sweet, fresh, plum and cherry notes. The wine is made from 100% old vine Grenache. Polished, sweet, juicy red fruits, medium bodied and softly textured, this luscious wine will be easy to enjoy on the young side with all its sweet, juicy, spicy, red fruits. The wine is made from 85% Grenache, 10% Syrah and 5% Mourvedre. Fleshy fresh, clean and packed with sweet, juicy kirsch, licorice and herbs. Sweet, fresh cherries and floral notes make their way into the elegant, polished, medium bodied, cocoa and raspberry finish. Dark in color, with rich, round, lush textures, loads of peppery, black raspberry, kirsch, thyme and spice, that feels great on your palate. The wine is made from close to 100% old vine Grenache that comes from vines that are more than 100 years old. Offering pleasure today, with its lush, ripe, sweet jammy black cherries, earth and spicy personality. Medium bodied, round, forward and soft on the palate, the wine is ready to go.